Judaea. Alexander Jannaeus, 103 to 76 BC. Bronze prutah. 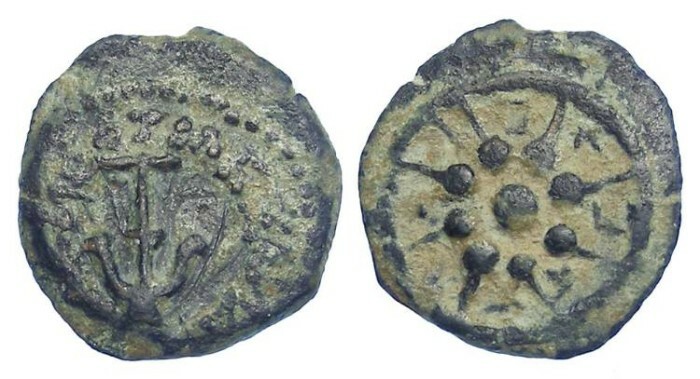 Reference : Sear Greek 6087. Hendin 10. Meshore-8. Size : 13.7 x 14.8 mm. Weight : 1.32 grams. Grade : good VF on a slighty small light flan, but with an exceptional reverse strike and centering. Obverse : Anchor with the inscription BASILEWS ALEXANDROU around, with about half of the inscription visible (about normal for these). Reverse : 8 pointed star iinside of a diadem, with Hebrew letters for "YEHONATAN THE KING" between the rays of the star. This is one of the types that can be consider the Biblical "widows mite".